I’m so excited to finally share this mega sewing project with you now it has been gifted to my lovely Mum! 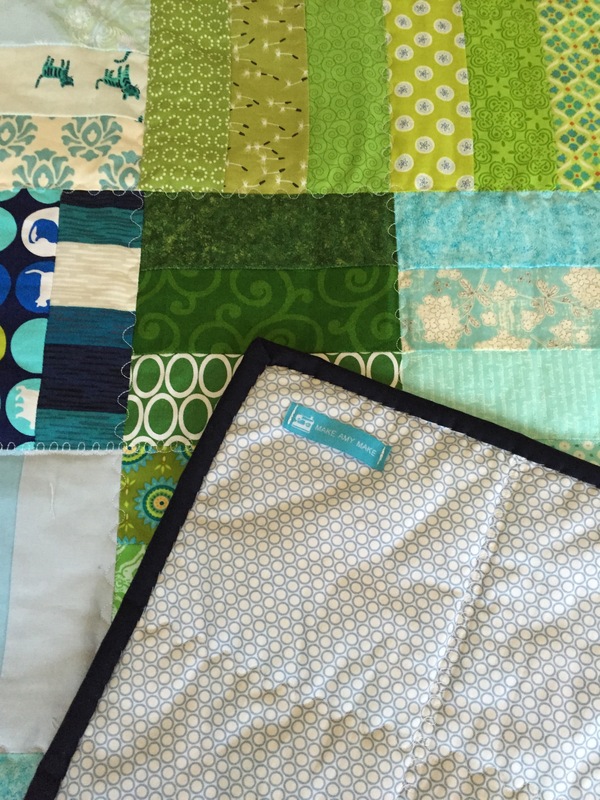 Back in the spring I promised my Mum a patchwork quilt for her bed and bought all of the materials. However it took slightly longer than I’d expected and ended up being a Christmas gift! Mum had said she wanted something bright and colorful, so I bought a lovely selection of green and blue jelly rolls in patterns and solids. These jelly rolls are cut and composed by the lovely Andrea of Quiltmanufaktur in Frankfurt Sachsenhausen – she has a fantastic eye for colour combinations! As Andrea makes her jelly rolls herself, they are half the size of those you buy in the States – from memory I think they have about 20 strips, so I bought 6 I think to make this quilt! 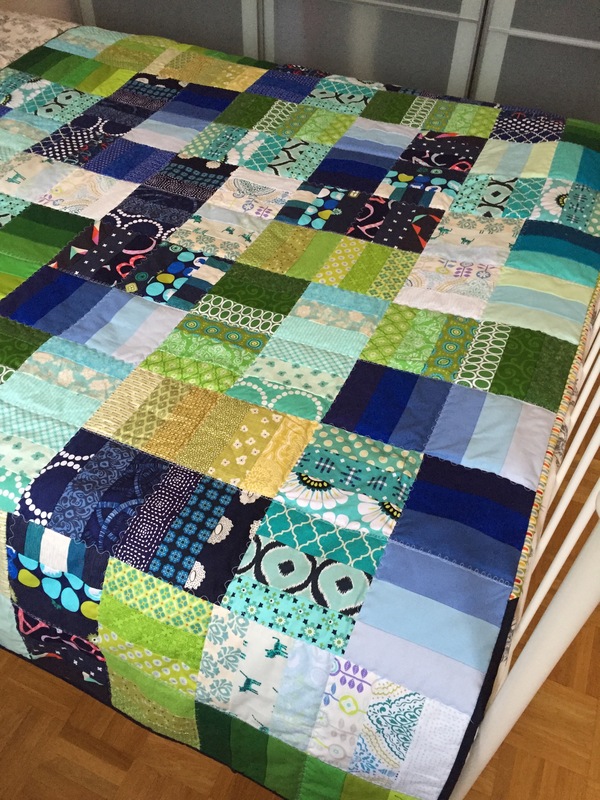 I loosely followed the free Jelly Roll Jam Quilt instructions – for those of you who have never quilted before this is a great place to start and I love the accompanying YouTube video! After I’d made all of my strip sets, I cut everything up in to rectangles and laid them out. I love the cute little tigers that pop up every now and then! When it came to laying out and piecing it together, I didn’t follow the Jelly Roll Jam’s instructions. With this number of prints and colours there were so many sets of blocks that I sort of just did it by eye. I think it turned out pretty well in the end though! Basting this project was a bit of a beast – I have to confess that the basting and the quilting are the bit I enjoy least, particularly when they are this big! I end up having to take over the lounge and crawl about on all fours which is very undignified! I keep promising I will try that fabric basting spray … Maybe next year? I got the beast basted in the end though and set about quilting! I am very lucky that my lovely Pfaff has an extra large arm space for quilting. I don’t think I’d dare tackle a project like this without it! It’s also got some fancy quilting stitches which I thought I’d try out – I did wiggly lines and loops in horizontal and vertical lines to create nice square patches on the back. I loved the finished effect, although was slightly regretting it half way through as loops take twice as long as straight lines! 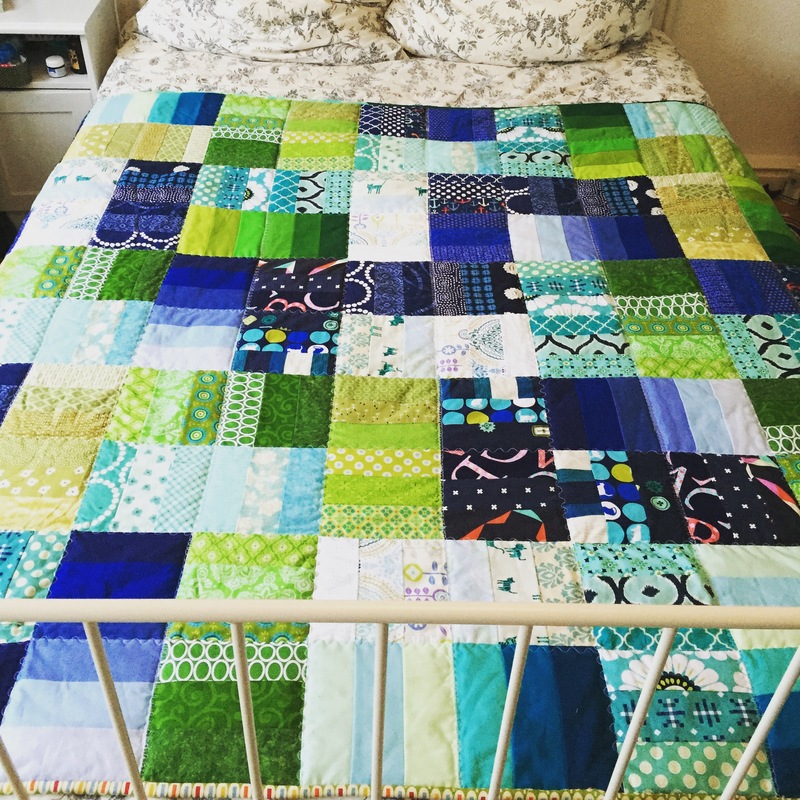 I finished my quilt with some binding made out of leftover jelly roll strips connected together. This is my favourite way of doing quilt binding as the jelly roll strips are the perfect width and also colour co-ordinate with the quilt top! I always use this YouTube tutorial on getting the perfect mitred corner and it works for me every time! After attaching the biding all that is left is hand sewing the binding down to the back of the quilt. I’m not normally a hand sewer and will use the machine where I can but this is one area where the machine just doesn’t cut it! I’ve learnt to love sitting in front of the Telly completing the final step by hand, with the aid of the most amazing wonder clips of course! So here she is, the finished quilt!! I am super happy with how it turned out – it was definitely worth the many hours that went in to making it! Every time I finish one I think ‘never again’ and about two weeks later I’m already thinking of the next one … Maybe I will just pick a lap size next time? It was great gifting this quilt to my mum on Christmas Day! Such a happy (partially) handmade Christmas!! Beautiful quilt! Love all the bright, happy colors & patterns. This is gorgeous, I’m so impressed! 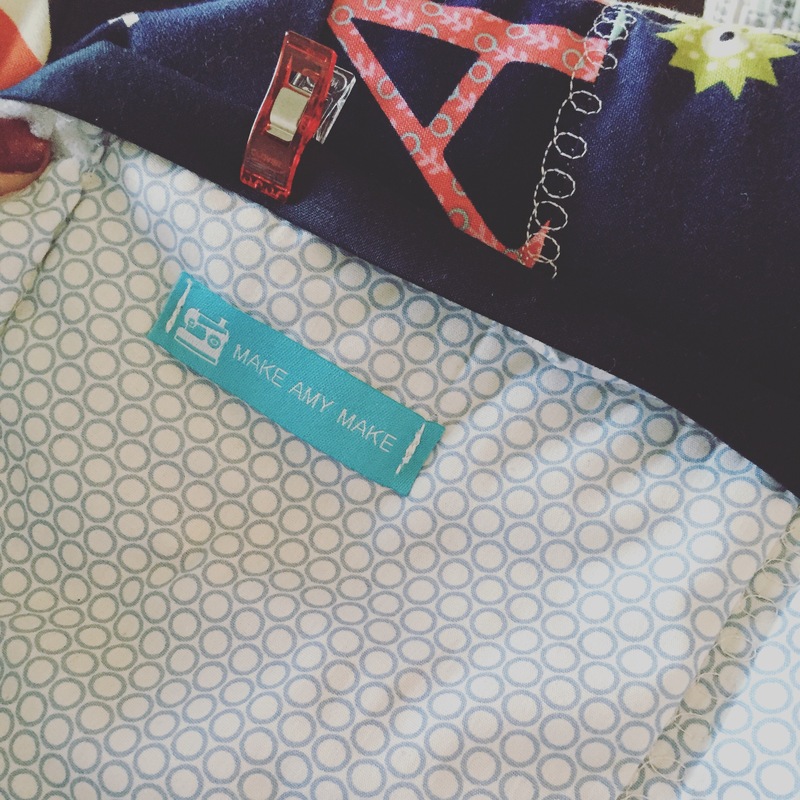 And what a brilliant way to make use of so many different fabrics…. 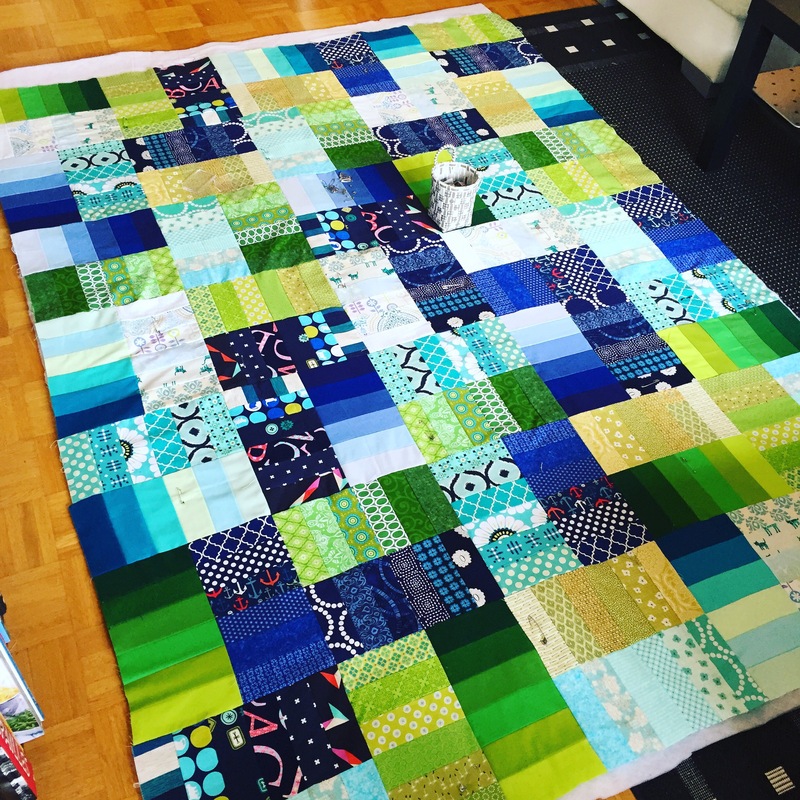 Quilting has always really daunted me but I’m now a little tempted…. Thank you 🙂 Definitely give it a go! I made a baby quilt for my first one which is slightly less scary! Jelly rolls are totally the way to go for your first one! I’ll look forward to seeing it!